Gorgeous ocean views, private deck, and comfortable timeshare accommodations create a wonderful atmosphere for a family vacation at Pelican's Perch in North Carolina. Holden Beach is on one of the barrier islands located on the southern coast of NC and features southern hospitality and a natural environment. Gorgeous ocean views, private deck, and comfortable timeshare accommodations create a wonderful atmosphere for a family vacation at Pelican's Perch in North Carolina. Holden Beach is on one of the barrier islands located on the southern coast of NC and features southern hospitality and a natural environment. 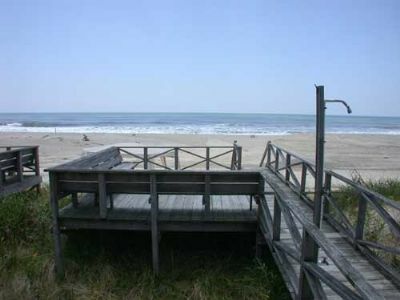 If you are looking for a quiet destination where you can enjoy the sun and long sandy beaches, you will love the Perch. 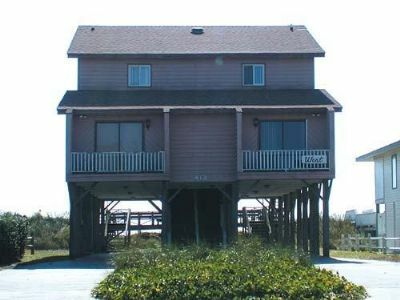 These Holden Beach timeshares for sale are a stand-alone building with two, three-bedroom units at Pelican's Perch. This stylish and newly remodeled duplex features modern beachy furnishings and all the comforts of a true vacation home. The master bedroom offers a king size bed, the second bedroom features two queen beds, and the third bedroom one queen sleeping up to eight guests. The well-equipped kitchen has a stove, refrigerator, microwave, and all the utensils to create gourmet meals right in your unit. The expansive outdoor deck features beautiful views of the ocean and easy access down to the beach. Free Wi-Fi, flat screen televisions, and washer/dryer are available in the unit adding to your convenience. And don’t worry about leaving your furry family member at home – pets are welcome! On-site amenities at Pelican's Perch include separate decks and personal space between the two townhouse units. The decks feature rockers and patio furniture where you can enjoy meals alfresco. Both units offer their own walkway down to the beach and a shared enclosed outdoor shower to rinse off when you get back. In addition to parking under the unit – there is plenty of street parking available for family and friends. The nearby town of Shallotte features a variety of restaurants and shopping, or plan to spend your time fishing off the pier or enjoying a variety of water sports. If you are looking for an amazing quiet beach destination for your next vacation, consider the Holden Beach timeshares for sale at the pet-friendly Pelican's Perch. When visiting with your family and friends you can take a walk down to the Holden Beach Pier or treat yourself at the General Store and Ice Cream Shop. North Carolina offers beautiful sunny weather during the summer months and the Perch is a great place to relax and enjoy the ocean. Start planning your next vacation today. Contact Pelican's Perch Specialist Today!